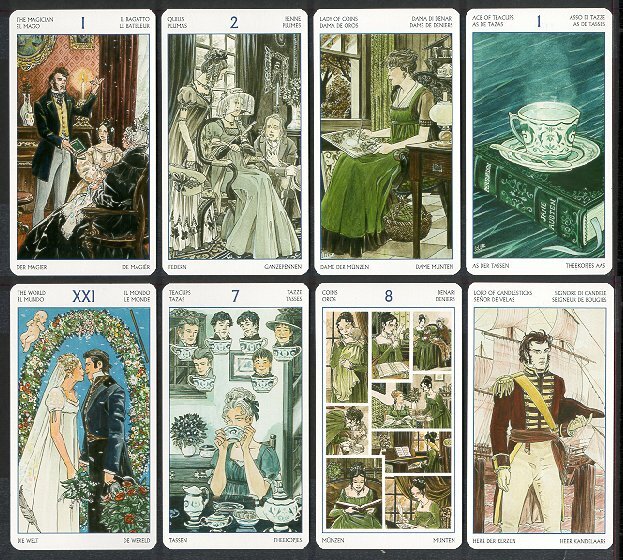 Or get the Tarot of Jane Austen Deck by itself. Measurements: 2.6 x 4.72 inches, or 66 x 120 mm. Back of card: Blue with ornate scrollwork. May be inverted. Book included: Yes, 176 pages, 5.9 x 8.3 inches, or 15 x 21 cm. In English. Illustrated (B&W). Publisher: Lo Scarabeo. Printed in Italy, imported by Llewellyn Worldwide. Suits in this deck are Candlesticks (wands), Teacups (cups), Quills (swords) and Coins. Court cards are Maiden, Knight, Lady & Lord. At a dance, the newly married Mr. Elton publically snubs & humiliates Emma's friend Harriet, but George Knightly comes to the rescue and asks her to dance, to Emma's great satisfaction. Emma takes pride in Knightly's gallant & upright nature as she watches them, while she dances with Frank Churchill, who is secretly engaged. I'm a simple, stupid country boy. This sort of thing drives me up a wall, but I digress. The book concludes with plot synopsis of Austen's seven major works. If you're a fan of Jane Austen, you should already know the titles.